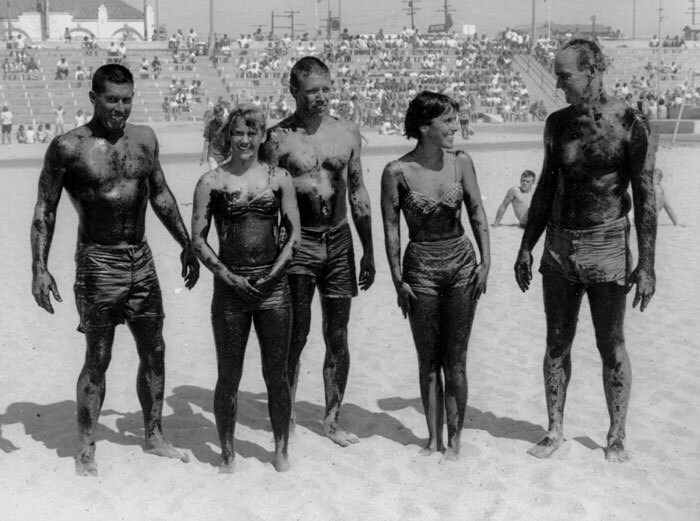 An oil tanker collision off of Huntington Beach caused a large spill of oil during the Fourth Annual West Coast Surfboard Championships held in Huntington Beach (imagine if this happened today during the US Open, then think about what the people in the Gulf have ben dealing with for months now). 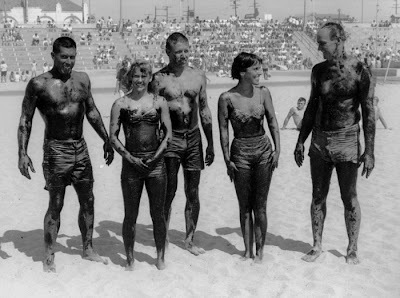 Tandem competitors, Bob Moore and Shelly Amarine (4th place), Hobie Alter and Laurie Hoover (3rd place), Pete Peterson and Patti Carey (who's missing, but finished in 1st place) were covered with crude oil from surfing in the spill. September 23, 1962. Photo: LeRoy Grannis.